Turkey gravy is an essential part of the Thanksgiving meal. Well, one that includes turkey anyway. Yet, I bet a lot of people resort to gravy from a jar, even if they've gone to the trouble to roast a full turkey, because they fear their gravy won't turn out right. It will be lumpy, runny or bland. But homemade gravy really isn't that hard. This recipe is really quite simple. It doesn't call for milk, there's no chance for undercooked flour and it comes together in about 15 minutes--just the right amount of time while the turkey is resting after its roast. 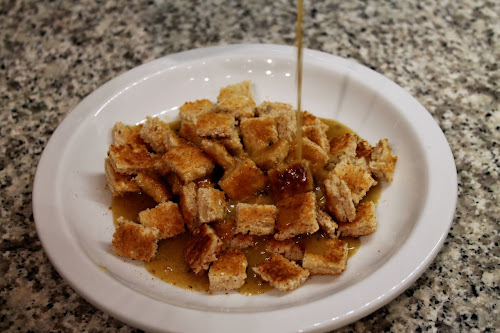 Cook the drippings and flour until lightly browned to ensure the gravy doesn't have a raw flour taste. Stir with a flat whisk to remove lumps. The key to keeping the gravy from not turning lumpy is to use a flat whisk to keep the flour in motion once it's been added to the pan drippings. That's really the only trick. Otherwise it's basically an overcooked roux with some chicken or turkey stock and a little herbs if you like (I used thyme, but bay leaf is good too). Note: This recipe makes about 2 cups of gravy, using the drippings from a roasted turkey breast. If you've roasted a whole turkey, you can certainly make more by scaling up the ingredients. It may need to simmer longer. 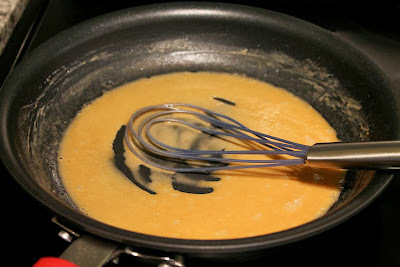 Add pan drippings and butter if using to a medium frying pan over medium heat. Add flour and cook, whisking constantly, until browned, about 2 minutes. Add broth, season with salt, pepper and thyme, and increase heat to medium-high. When mixture boils, reduce heat to medium and simmer for 5-7 minutes until thickened. Transfer mixture to a pourable container (such as a Pyrex glass measuring cup) to cool a bit before serving. I can attest to the simplicity of the process Mr. Cook In / Dine Out describes above. I was there when he had the idea to do this post. "I think I'll make gravy," he declared as he sprang from the sofa and headed for the kitchen. He was back in his seat just a short while later.